WooCommerce is a powerful eCommerce toolkit. The first place in this category is held by Wix which has a total score of 9.8/10 and is the winner of our Best Shopping Cart Software Award for Q1 of 2018. You can try out Wix for free here. It was developed to transform any WordPress website into a beautiful online store. Designed and constructed using WordPress best practices on the front and back end, WooCommerce comes a very reliable and robust eCommerce plugin that boasts of enterprise-level quality and features. 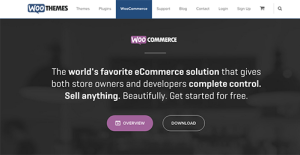 WooCommerce is a perfect plugin if you want to build an stand-alone online store from the ground up or if you wish to start selling products using an existing WordPress blog or website. It is a free plugin but priced upgrades and updates are also offered for those who want to experience the best from WooCommerce. It is a free eCommerce plugin that comes with a robust set of tools and features that you need to get started. Full support from the WooCommerce team as well as from user communities that include software experts and actual business owners. Open source codebase: WooCommerce is fully open sourced, meaning the code is freely available for anyone to view, modify, and contribute towards. The open source nature of WooCommerce encourages an active community of contributors to the project. Powered by WordPress: Powering approximately 24% of the internet, WooCommerce enables these website owners to sell online using a platform they already know and love. Intuitive and powerful interfaces: WooCommerce focuses on making the process of setting up your online store as quick and easy as possible. It offers an onboarding wizard to guide you through the setup in under five minutes. Extension library: WooCommerce boasts a wide range of official extensions (add-on features) such as payment gateways and shipping calculators for your specific country, advanced tax calculators, membership system management, subscription management, anti-fraud and many many more. This library is also backed by a large collection of actively-developed community extensions. What Problems Will WooCommerce Solve? 1. Scalable: When growing their online presence, companies often run into scaling issues with their platform of choice. Powered by WordPress, and with savvy developers behind the project, WooCommerce is able to scale as rapidly as your business. 2. Customizable: Your store operates out of Spain and requires a Spanish payment gateway to be connected. You also require a shipping rates calculator connected to the small local shipping company you’ve decided to work with. Being open source and extendable, it is easy for developers to craft customized integrations with just about any service provider. 3. Logically feature rich: WooCommerce core includes all of the core features required to run an online store, with none of the bloat. From the simple action of adding and managing products, to advanced stock controls, tax rates calculations, and order management, WooCommerce handles all of this swiftly. If you are interested in WooCommerce it might also be beneficial to analyze other subcategories of Best eCommerce Software gathered in our database of SaaS software reviews. It's important to realize that almost no software in the eCommerce Software category is a perfect solution able to match all the goals of different business types, sizes and industries. It may be a good idea to read a few WooCommerce reviews first as certain services can dominate exclusively in a really small group of applications or be created with a very specific type of industry in mind. Others can work with an intention of being easy and intuitive and consequently lack complex elements desired by more experienced users. There are also software that cater to a broad group of users and offer a powerful feature toolbox, however that usually comes at a more expensive cost of such a service. Make sure you're aware of your requirements so that you pick a solution that has specifically the functionalities you look for. Woocommerce is a free shopping cart plugin. For those who want more than the basics, Woocommerce offers priced license upgrades, extensions, and updates. We realize that when you make a decision to buy Shopping Cart Software it’s important not only to see how experts evaluate it in their reviews, but also to find out if the real people and companies that buy it are actually satisfied with the product. That’s why we’ve created our behavior-based Customer Satisfaction Algorithm™ that gathers customer reviews, comments and WooCommerce reviews across a wide range of social media sites. The data is then presented in an easy to digest form showing how many people had positive and negative experience with WooCommerce. With that information at hand you should be equipped to make an informed buying decision that you won’t regret. What are WooCommerce pricing details? What integrations are available for WooCommerce? Pros: WooCommerce is outstanding solution which is easy to setup and it is extensible so you can make as much customization as you need. There are lot of ways of how to use it, starting from non developers to full engineering departments. For beginners this is perfect solution to start their business with highest speed. Cons: WooCommerce is perfect solution, but what I don’t like is the fact that is build on WordPress and here comes some issues with security and performance. On the other side, I do believe that WP will make major improvements when it comes to their eco-system. Pros: If I had to choose a single favorite feature, that would be affordability. Woocommerce is for free, which makes it accessible to small and developing businesses that cannot make mindblowing investments in ecommerce. Set up was easier than I expected, and I purchased few plugins to improve my website. Some of the plugins were free too. Overall, there are many features that make WooCommerce special-in certain cases, it is even better than Shopify. Cons: The best plugins are obviously paid, I guess that's the reasoning behind the creation of a functional and free app. It wasn't such a problem for me because I was most often able to find free alternatives, but that's not always the case, unfortunately. You may find yourself investing $60 for addons you know nothing about, and I'm not sure how many small businesses can handle that. Do some serious research before buying whatever!